Below is a list of common plastering jobs on the approximate costs. We look at prices for replastering over existing plaster to a thickness of 3mm. We also look at prices for removing old plaster and starting from scratch and the costs of plastering a ceiling. There is a deeper level of knowledge and skill required to obtain a perfect finish. It requires the use of specialised tools and equipment (scaffolding for example, is required when rendering a multistorey building). The results of a poor DIY job may take time to come to light but may result in more damage than it would have cost to hire a plasterer in the first place. A professional plasterer hired via RatedPeople for example is insured and will provide a guarantee for their work. When all the factors above are taken into consideration, it becomes evident that hiring a professional plasterer is worth it. You will need to ensure you do your research to find the best plasterer available for the money you are willing to pay. Get FREE Plastering Quotes Today!Note: This article is not meant to be one sided. There are plastering jobs you can do yourself if you have the right equipment, skills and confidence to do it. On a value for money basis, a professional plasterer is likely to do the job faster and to a higher quality than you. Knowing this, it’s now up to you to decide which way is best for you. How much you will pay for getting your room or entire house plastered will depend on the amount of plastering to be done. Most plasterers will use a measurement of how many square metres of wall space will require covering. This is mostly due to the number of plasterboards and other materials the plasterer will need to purchase, how long the work will take and the labour of course. Standardising costs to a per square metre basis allows you to compare quotes with ease. Another popular means plasterers use is a measure of the room size. This is why it’s common to find pricing in terms of small, medium and large rooms. 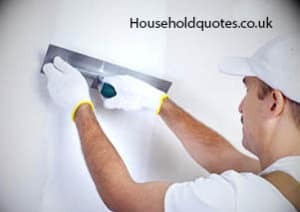 All this does is it gives you a starting point because until the plasterer comes in to have a look at the job at hand, all you have is an estimate. There are some plastering jobs which plasterers call their staple, or bread and butter jobs. These are given below, with an estimate of the price and time it will take to complete each type of job. Again, this will provide you with an estimate from which you can work out your budget. This is one of the most common jobs for plasterers which some home owners can probably carry out on their own. Repairing or re-skimming over existing plaster to correct blemishes in plaster. For a small room, prices range between £380 and £500. For medium rooms, you can expect to pay from £420 and £550 respectively. Average duration is between 1 and 2 days depending on the size of the room. Another popular job is applying new plaster to walls. This job involves stripping the existing plaster and takes slightly longer than replastering. Other aspects of the job include dry lining, skimming and applying cosmetic finish to the plaster. Get FREE Plastering Quotes Today! Costs for small, medium and large rooms start from £600, £650 and £1,000 respectively. This price includes materials and labour but excludes VAT as some of the contractors are self employed or work as sole traders and are not VAT registered. Old plaster will require a skip for disposal and this may increase the overall cost of the job. A typical plastering job will last between 2 and 4 days. Plastering the ceiling is one aspect of plastering that takes a lot of effort but can be done quickly with the right tools and equipment. Overboarding and plastering a small, medium or large ceiling should cost from £200, £280 and £425 respectively. Time wise, it should take anything from 6-12 hours for the small ceiling, 8-12 hours for the medium sized ceiling to 2-3 days for the large ceiling. Unless you are an accomplished plasterer this is one aspect of the trade best left to professionals. Prices will depend on the size of the property and whether it’s a single or multi-storey building. Additional costs for multi-storey buildings are incurred from scaffolding hire which can be costly. 2 bedroom bungalow – anything from £1,900 and 4-6 days to complete. 3 bedroom semi – prices from £3,800 and 5-8 days for the job excluding scaffolding hire. Always ensure the final price you are quoted includes everything needed to do the job. 4 bedroom detached house – from £4,500 and 7-14 days for the finish. As you can see from the information above, the costs for various plastering activities varies. Using a site like Rated People will allow you to control your costs while finding a reputable and trusted plasterer. I could do that for £4000 including materials, no VAT is applicable. £3800 includes materials just a reskim, 16 years plastering experience. £6700 including material total hack off and reboard and skim. Get Your FREE Plastering Quotes NOW!